Bormio is situated in Valtellina. The Valtellina is a beautiful Alpine valley that boasts a great variety of unexpected landscapes with perpetual snow, mountain peaks and glaciers, nature parks and vineyards. But there is much more to the valley than the scenery: visitors will also find ancient towns and villages, medioeval castles, baroque places, museum and art collections at they enjoy the extensive, well-organised tourist facilities. 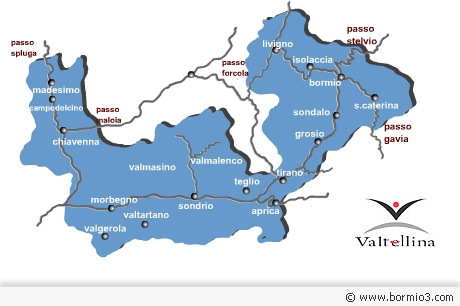 Situated in the extreme north of Lombardy on the border with Swizerland, the Valtellina lies on what has always been a major trading route between northern Italy and central Europe, over which the ruling forces in the area vied for power. The history of its proud populace and of the political and religious strife the area has witnessed down the centuries is evidenced to this day in the many surviving palaces, churches and monuments. Indeed the entire valley is pervaded by vestiges of its rich artistic and historical past, encompassing everything from the prehistoric rock cavings at Grosio to the World War I trenches in the Stelvio. But as well as its cultural heritage, the Valtellina is also an area of great natural beauty. Nature lovers and sports enthusiasts come here to enjoy a whole range of outdoor pursuits all year round, in a valley dominated by some of the most beautiful and best-known mountains in the Alps. Its internationally-renowned tourist resorts have been attracting skiers and mountaineers from Italy and abroad since the 19th century. The best skiing resorts are Bormio, Santa Caterina Valfura, Livigno, Aprica and Madesimo, the venue of such international events as the 1985 and 2005 World Alpine Skiing Championships. The Stelvio National Park, the largest in Europe. Other areas of natural interest include: the Valtellina Orobian Alps Regional Park, the Acqua Fraggia Waterfalls and several nature reserves (Marmitte dei Giganti, Pian di Spagna and Lake Mezzola, the Postalesio Pyramids, the Bordighi Forest, Pian di Gembro and Paluaccio di Oga. The Valtellina is a year-round paradise for outdoor enthusiasts, offering everything from winter and summer skiing, ski-mountaineering and hiking, to rock-climbing, mountain-biking, horse-riding, golf, canoeing, hang-gliding and angling.